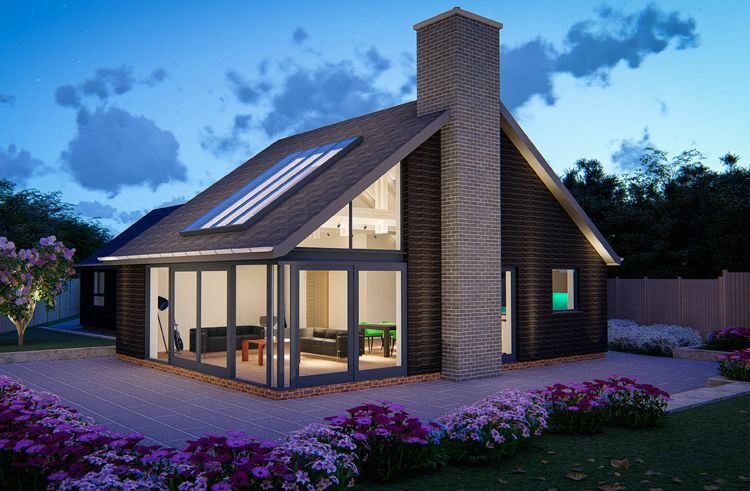 Lesley Connors asked Howie Architects to help her transform her home near Wymondham, in Norfolk. Q: What was your property like before work began? A: It was a 1985-built bungalow, set in one-third of an acre: it still had much of its original décor and features such as artex, pine panelling and a 1980s’ bathroom. Q: How did you hope to change it? A: We wanted a home with space to accommodate our grown-up children and our grandchildren when they came to visit; we also wanted it to be suitable for my partner who has Parkinson’s disease. I knew I wanted an open-plan living space, a master bedroom with a wet room and a guest room with an en suite bathroom for visitors. Q: Why did you decide to use an architect? A: There was no way I would not have employed an architect. I run an optician’s practice and believe it is very important to value professional capabilities and qualifications. I was therefore in no doubt that we needed an architect involved. Q: How did you find Alastair? Q: How did you find the process of working with an architect? A: Fantastic. He was able to take my ideas and convert them into something that would really work, something modern that was perfect for us in terms of space. For example, I had been thinking about remodelling the house to the same footprint, but he suggested extending slightly to the side and back. This has made all the difference. Q: What did Alastair himself bring to the project? A: Creativity. I love the way the house looks like a traditional-shaped bungalow from the front but when you step through the door and come into the main living space it has is such a wow factor. He suggested touches such as bringing oak beams into the vaulted living space to tie in with the floor and his advice on use of colour and lighting has also been very helpful. Q: Did everything run smoothly? A: Yes. The design and planning stages went well. Alastair introduced us to our builders – and they absolutely got what we were trying to do here as well. He then came through the construction process with us, attending fortnightly site meetings, discussing any concerns, clarifying what was happening and liaising with the builders. One corner of the house is completely glass and required special load-bearing beams, so it was good to have him around to oversee that. Q: How did the final project turn out? A: Brilliantly. We are just putting the finished touches to it now. The outside is being clad and the builders are now constructing a retaining wall for the decked patio outside. Originally, we decided to have a cart lodge but then Alastair came up with the idea of transforming an existing garage and using some of the same materials as the house to tie it all in. That will look great too. Q: What are you enjoying about your home now it is complete? A: Absolutely everything! The space is amazing – I can be in the kitchen and my little grandson can be playing on the rug and I can still keep an eye on him. The new wet room and having everything on one level is brilliant for my partner; we both enjoy being able to have people to stay so comfortably. I love being able to sit on the sofa inside the house in the evening, looking out at the outlines of the trees as it gets dark and up to the stars through the skylight windows at night. Q: Would you advise others considering a similar project to use an architect? A: I would say don’t even contemplate doing it without one, especially something like this. We have such a large roof, with a big open space below, so it was important to have someone who really knew what they were doing. You hear such horrors of buildings going wrong when architects are not involved – but we have just been delighted with everything here and Alastair has been an important part of that.